Yesterday, Dr. Davit Khachatryan, who is an Isenberg School PhD alum in Management Science, and now is a Professor at Babson College, gave a captivating lecture in our UMass Amherst INFORMS Speaker Series. 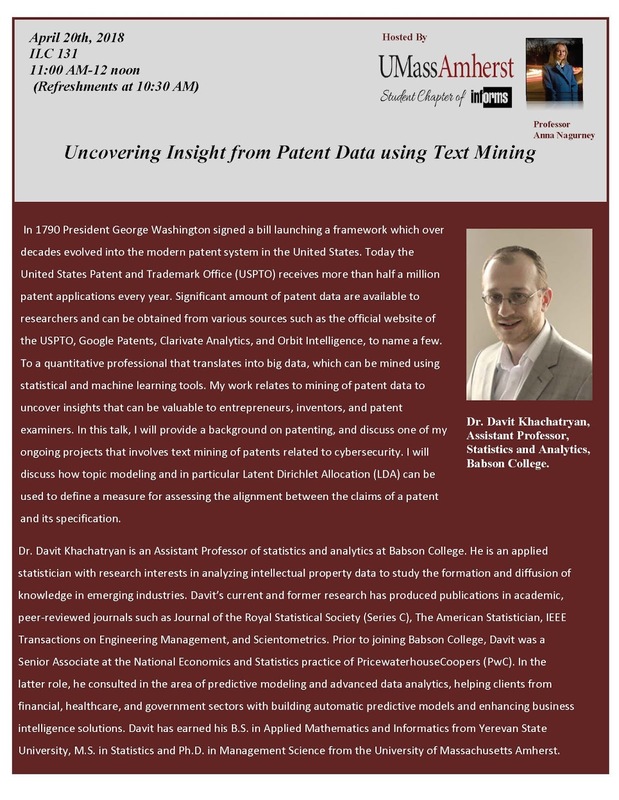 The title of his talk was: Uncovering Insight from Patent Data Using Text Mining. Prior to joining the faculty at Babson College, Davit was a Senior Associate at the top consulting company, PWC. It was a pleasure to welcome a very successful alum back to campus! Davit was the 8th and final guest speaker in our series for the 2017-2018 year. This year we had the pleasure of hosting Professor Renata Konrad of WPI, Professors Shannon Roberts and Hari Balasubramanian of UMass Amherst, Professor Dmytro Matsypura (also an Isenberg School PhD alum and my former doctoral student) from the University of Sydney in Australia, Dr. Les Servi of MITRE, Professor Jim Orlin of MIT, and Professor Burcu Balcik of Ozyegin University in Turkey. As the Faculty Advisor to the award-winning UMass Amherst INFORMS Student Chapter, I help the students to organize this Speaker Series, which adds tremendously to the intellectual life of the Isenberg School and UMass Amherst and also provides leadership and networking opportunities for the students. After each talk, I host a lunch at the UMass Amherst University Club so that we get to know the speaker(s) in a relaxing manner and continue the discussions. Deniz Besik, the President of the Student Chapter this year, introduced Professor Khachatryan and then he began his lecture. He provided us with a fascinating introduction to the patenting process in the US, dating back to President George Washington and noted that the first patent in the US was issued in 1790 to Samuel Hopkins and it was signed by Washington. The first business processing patent was given to Herman Hollerith in 1889 and then the company was renamed as IBM. There were more than 100 million patents issued worldwide by 2016. In effect, a patent is a government-sanctioned right for a short-term monopoly to exclude others for 20 years, Davit said. However, a patent is public knowledge. and noted that a patent could be challenged for validity, once it is granted, and he singled out the Cisco vs. Cirrex Systems case, which Cisco won. He emphasized why validity matters - a patent not only needs to be granted but should stay granted. His research involves, in part, identifying the "drafting quality" of a patent and seeing, through text mining and statistics, whether the specifications in a patent application and the claims align. And, intriguingly, he identified all business processing cybersecurity patents since November 29, 2000, using a NIST keyword glossary and arrived at 2,379 such patents, and displayed a slide with those who are responsible for such patents, which include many company household names. His approach makes use of LDA - Latent Dirichlet Allocation, based on the work of Blei et al. (2003). Each document is a probabilistic mixture of topics and he identified 300 cybersecurity topics in the patent data. He discussed text mining issues such as the preprocessing of data (the removal of Greek letters, for example), the removal of common, patent-related language, stemming, tokenization to unigrams - a vector of words and the construction of a document-term matrix. I very much appreciated his measure with credit given also to Hellinger to construct a single number for each patent document. The lecture was outstanding and members in the audience were from the Isenberg School, the Department of Mechanical and Industrial Engineering, as well as the Department of Civil and Environmental Engineering, among other departments at UMass Amherst. 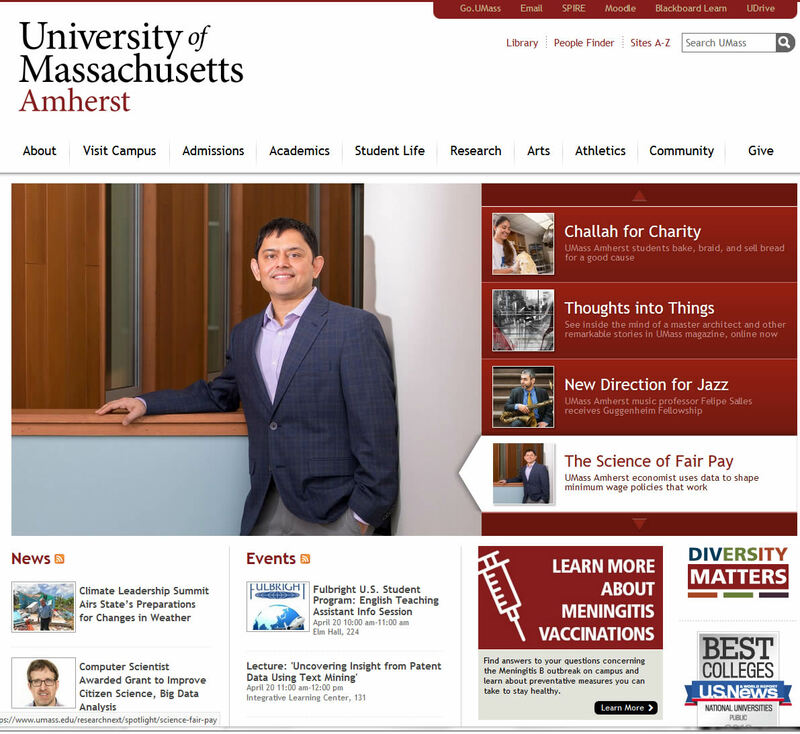 I was delighted that the announcement for his talk made the UMass Amherst homepage! After a lot of applause, we took a group photo of some members of the audience with the speaker and then headed off to lunch. The conversations at lunch were fabulous and ranged from updates on what is happening in the Isenberg School and UMass to GE and even Armenia, the country where Professor Khachatryan was born. And, as is our tradition, we topped off the delicious lunch at the University Club with dessert. After, dessert, Professor Khachatryan was interviewed for the chapter's youtube channel and I will let you know when the interview gets posted. We thank our guest speaker, Professor Davit Khachatryan, for such an illuminating and fascinating lecture! I must admit our Isenberg School of Management Management Science PhD alums are incredible educators and role models. The 2018 INFORMS Business Analytics Conference, which took place in Baltimore, MD, April 15-17, 2018, was fantastic! The conference brought together over 1,000 leading analytics professionals and industry experts (executives, analysts, managers, researchers, data scientists, modelers, etc.) from around the globe to exchange ideas, network, and learn about the exciting results, insights, and opportunities generated by analytics. This is one of my favorite conferences to speak at and to attend because of the interactions with industry professionals, representatives from government, and fellow academics as well as numerous students. Below are the smiling faces of the speakers! I flew in on Southwest on Sunday and returned back last night feeling energized and with my brain swimming with new ideas and I expect new collaborations as well. What I found especially delightful was seeing many fellow operations researchers and analytics professionals. I had very pleasant exchanges with conferees from the US, Sweden, Mexico, Turkey, Colombia, Serbia, Germany, and Japan. Honestly, I can't think of another conference that provides a better return on investment in terms of what you get out of it per unit time! My room on the top floor of the Marriott Waterfront Baltimore had a fabulous view and it was very convenient since all the sessions and social events took place an elevator ride down. The talk that I presented was on cybercrime and cybersecurity and it can be downloaded here. Getting selected to speak involves a competitive screening process so I was thrilled to be able to speak on some of our latest research on this topic. The previous INFORMS Analytics Conference that I had spoken at and also thoroughly enjoyed was in Boston in 2014. The conference began for me with the super dynamic plenary talk by Bill Schmarzo, who, coincidentally, is also an Executive Fellow at the University of San Francisco, where my most recent Isenberg School PhD student alumna, Dr. Shivani Shukla, is now an Assistant Professor, and with whom I wrote several papers on cybersecurity. I took copious notes and enjoyed hearing him say that it's insight from data that matters and that one must start with the business. He spoke on the monetization of data and the leveraging of predictive and prescriptive analytics in order to optimize. I loved his discussion of data being an "unusual currency." In our registration packets we were provided with a lot of nice conference "swag," including a beautiful blue notebook and a very cool conference bag. Meals were provided, including the gala Edelman dinner on Monday night (more on this later). The plenary talk by Bruce Greenstein, the CTO at the US Department of Health and Human Services, which he told us is the largest single government department in the world, was also excellent and took place bright and early on Tuesday morning at 8AM. His presentation was on: From Data to Analytics: How to Solve Complex Health Problems. Greenstein spoke on Secretary Azar's focus, which includes combating the opiod crisis, bringing down the high cost of prescription drugs (and here he emphasized increasing competition, which is great), and transforming the healthcare system to a value-based system. He spoke of his unique position in connecting various departments and bridging the technical divide and also emphasized the improvement of analytics at HHS through the sharing of data, bringing in experts, and chipping away at the culture. There was even an opioid-code-athon that was very successful and I especially appreciated hearing about the "prevention track," which focused on predicting and analyzing the supply and movement of legal and illicit opioids (sounds like a network flow problem to me and probably even related to the network models that I spoke of on Monday at the conference). There is even now a Co-Lab at HHS, which is an enterprise data initiative, and led by Will Yang. I had the pleasure of listening to Greenstein's plenary while seated next to Dr. Les Servi of MITRE and Professor Tamas Terlaky of Lehigh University. Les and I go back to Brown University days and he was on the organizing committee of the conference and we hosted him recently in our UMass Amherst INFORMS Speaker Series. Professor Terlaky led the group that was awarded the 2017 Daniel H. Wagner Prize for Excellence in Operations Research Practice, for “The Inmate Assignment and Scheduling Problem and its Application in the PA Department of Corrections." I went to his talk on this outstanding project and enjoyed it thoroughly. Both Les and Tamas are INFORMS Fellows. Other highlights at the conference, in addition to the outstanding talks that I attended, which were 50 minutes in length so you can really learn something, and which included those by Professor Jim Cochran of the University of Alabama and Dr. Mary Helander of IBM, was seeing Dr. Michael Prokle, a former doctoral student from UMass Amherst, now a data scientist at Phillips Research in Cambridge, and taking part in "coffee with a member." Michael was the President of the UMass Amherst INFORMS Student Chapter and I nominated him for the INFORMS Judith Liebman Award, which he received. Coincidentally, we had both been at the Boston Analytics conference, where the weather was also cold and rainy. I very much enjoyed meeting and having coffee with Sarah Greenwood, who is pursuing a graduate degree in analytics, and already has several years of experience working in industry. It is thrilling to see such outstanding individuals excelling in STEM! I would also like to point out and thank WORMS (Women in Operations Research and the Management Sciences), one of my absolutely favorite fora of INFORMS! And, would you believe that years ago I found out about WORMS from my male PhD students at the Isenberg School of Management, who told me that they loved many of the conference events organized by WORMS, so I joined! If you are a good leader, you are advocating. Luck is manufactured: one has to be open to new ideas - we create our own luck. And, quoting Madeleine Albright: "there is a special place for women who don't help women." Also, from an HBS Review article:" Women have mentors; men have sponsors." Confidence is a core leadership skill. Diversity is a fact: inclusion is a choice. The Q&A session that followed was provocative and I told her that she should write a book and I would be more than willing to help her with it. At this session, I was joined by truly special colleagues. And, since Michael Prokle was the President of our UMass Amherst Student Chapter when we hosted INFORMS Fellow Dr. Radhika Kulkarni, VP of SAS, I had to have the photo below taken as a memento. Also in the photo is Dr. Mary Helander of IBM, who has also spoken in our Speaker Series! Of course, going to exhibits is also enjoyable and it was great to see my book, Competing on Supply Chain Quality, co-authored with a former doctoral student of mine, Dr. Dong "Michelle" Li, on display at the Springer booth. Many thanks to the Senior Editor, Matt Amboy, for displaying it. And, speaking of students, INFORMS hosted a student competition, and I spoke with groups from Turkey and Colombia, who were finalists. I have not heard, yet, who received the first prize, since I had to leave the lunch early yesterday to catch my flight. And, on Monday evening, those at the conference had the honor and pleasure of taking part in the Edelman gala banquet and awards ceremonies, hosted by Dr. Don Kleinmuntz of Kleinmuntz Associates and the University of Notre Dame, who was a magnificent emcee! At the 2014 Boston conference, we had the pleasure of Dr. Anne Robinson being the emcee at that Edelman gala, at which the US CDC received the Edelman Award for the eradication of polio. The food at the dinner was delicious as was the company at our table. And a HUGE congratulations to the winners of the 2018 Edelman prize and to all the finalists! The award went to the US Federal Communications Commission (FCC) for advancing wireless communications. The team included INFORMS Fellows: Dean Mike Trick of CMU and Professor Karla Hoffman of George Mason University! I can't help but mention that one of the coaches of the winning team was Dr. Irv Lustig of Princeton Consultants - I was his TA from the Operations Research course at Brown University when he was an undergraduate and I was a PhD student. Amazingly, two of the awards noted on Monday night have Brown University connections! Franz Edelman, after whom the Edelman Award is named, received his PhD in Applied Mathematics from Brown University (and so did I). Also, Daniel Wagner, after whom the Wagner Prize is named, received his PhD, also from Brown University, in mathematics! I enjoyed hearing my alma mater being noted twice at the gala dinner on Monday night and it is quite amazing that both Les Servi and Irv Lustig and I overlapped during part of our Brown U. days! I would like to end this blogpost with a big thanks to the INFORMS staff for making this conference so enjoyable and rewarding. I wish everyone safe travels back from the conference! When I landed at Bradley, my shuttle driver told me about the terrifying Southwest plane engine failure on the flight from LaGuardia to Dallas, which had an emergency landing in Philadelphia. Thinking of those injured and the loss of life and the terror and fright that all must have experienced. Yesterday was the final guest lecture in my Humanitarian Logistics and Healthcare class this semester at the Isenberg School and it was extremely timely and interesting. The students and I had the privilege of hearing from Ms. Ann Becker, who is the University Health Services (UHS) Public Health Nurse and the Unit Coordinator for the Medical Reserve Corps at UMass Amherst. The title of her guest lecture was: Meningitis on Campus - Reaching Students During a Meningitis-B Outbreak. As some of you may have heard, this past Fall there were two cases of Meningits-B, one in late October, and the other three weeks after. Since no linkages between the two cases could be identified, the Centers for Disease Control (CDC) termed these cases an outbreak. Students get vaccinated for other strains regularly but not for the B strain. And, in early March, the CDC confirmed that another case was diagnosed in a Smith College student, so this is now a 5 College outbreak. This disease is very rare but it can progress rapidly with extremely dire effects. I remember last semester when I was teaching my Transportation and Logistics class at the Isenberg School that one of the students in this class knew the first student to contract meningitis-B because they were both in the same fraternity, and he was involved in helping to raise funds for the student's care and recovery. 10-40% of 16-24 year olds are carriers of this bacteria, and the illness is transmitted through direct contact with secretions. Risk factors include large parties and sharing of drinks, cigarettes, etc., and being stressed and not sleeping enough only increases the probability of contagion. It takes at least a week to identify the meningitis strain from a culture and these were sent both to the Massachusetts DPH and the CDC. The UMass Amherst campus responded extremely professionally. There had actually been simulation exercises in place for a mass vaccination and I had even blogged about this. This was inspired by the cases in the US a few years back on college campuses, including Princeton University. And, at that time, there was not even a vaccine available in the US (but was in Europe). The UMass Amherst campus responded with an emergency call center, since, once the news went out, the staff was inundated with calls. Staffing was identified for the initial vaccination clinics and vaccine supply and cold storage had to be managed. It was interesting to hear that the annual flu clinics also served as a prep for the mass vaccination clinics. UMass Amherst, as a university, is in the business of education, and it was essential to have no disruptions to courses. The healthcare staff, with assistance from nursing students and the Medical Reserve Corp, in 3 hours gave 700 vaccinations. "Being prepared and knowing people" helped in the efficiency of the processes as well as their effectiveness. The cost for 10,000 doses was $1.5 million from Glaxo Smith. In order to reach students, there were numerous communication media that were utilized - from social media and emails to the notification of parents and having a dedicated strip banner with info on the UMass homepage. Also, the MA DPH sent out messages to every healthcare provider in the state. Two shots are required for the vaccine and there was a one week Thanksgiving break in late November with some students also getting their first vaccines from their home healthcare providers. UMass Amherst had 4 walkin clinics over consecutive days from noon until 6PM and Ms. Becker showed the class an excellent diagram with the flow of the process, which is something all the Operations students enjoyed and appreciated. It began with the registration and asking for the insurance (if students or insurers could not pay, then (bravo) UMass Amherst covered the expense). Impressively, the number vaccinated reached 1,500 per day with the longest wait time of 20 minutes, which is not bad, given the volume of students as well as the severity of the disease. It was interesting to hear that the processes were aided by the youth of those vaccinated and that they were all ambulatory. There are still unknowns, however, since we don't have an accurate count of how many students have received the two shots that are needed, as Ms. Becker pointed out in her lecture. Interestingly, she also mentioned that, after a year of no more outbreaks, can we be considered "in the clear." They do know that more than 3,000 + students have already had 2 shots. Our University Health Services are continuing with walk-in clinics, which is great and also reassuring, and they have also done an amazing job in educating students as to proper behavior so that this bacteria does not spread. We presented our fabulous guest lecturer with a certificate and a gift from the Isenberg School and took the group photo below as a memento. And, in her last slide of her presentation, featured above, we can see our Chancellor, Dr. Kumble Subbaswamy, "saying": Get Vaccinated. It was very special to have Ms. Becker speak to my class and her expertise and kindness are truly inspiring. We are very lucky to have her at UHS at UMass Amherst! There are so many wonderful aspects to being an operations researcher, and one of my favorites is the fabulous researchers that we get to meet from around the world. Also, there is always some serendipity (and luck) when it comes to inviting speakers whose research is especially timely. Since 2004, when we established the UMass Amherst INFORMS Student Chapter, I have been helping the students host the Speaker Series, and we have brought many amazing luminaries to UMass Amherst to deliver a seminar. This semester I am teaching two courses and also giving a lot of invited talks both in the US and abroad so scheduling of speakers is sometimes a bit of a challenge but we do make it work. Propitiously, Dr. Burcu Balcik, who is the author of several papers that my students in the Humanitarian Logistics and Healthcare class that I am teaching at the Isenberg School of Management this semester, has been on sabbatical in Montreal this year. She is an Associate Professor at the Ozyegin University'sIndustrial Engineering Department in Turkey. When she reached out to me a few months ago I knew that we had to bring her down to give a talk. And that we did! Last Thursday, she flew in from Montreal to Boston Logan, then made it to Amherst. I had the pleasure of having dinner with her at Judie's restaurant in downtown Amherst on Thursday. We had advertised her talk widely and the announcement even made the UMass Amherst homepage on Friday! 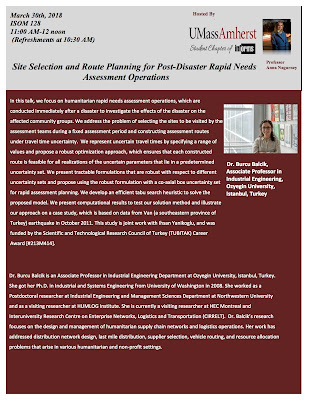 The title of her talk was: Site Selection and Route Planning for Post-Disaster Rapid Needs Assessment Operations. I have known Burcu for a decade now and have enjoyed most recently conferences with her in Vienna, Austria on Humanitarian Operations (which was organized by my former Isenberg School PhD student, Tina Wakolbinger, who is now a Professor at the Vienna University of Economics and Business) and also INFORMS in Houston. Her lecture was simply outstanding - delivered with great clarity and generated many questions from the audience, which always demonstrates interest! I was delighted to see faculty and students from both the Isenberg School and the College of Engineering in attendance (even though it was just before an Easter and Passover weekend) and even students from my class came. We counted 12 different countries represented by the attendees in the audience! I had the pleasure of welcoming her and the UMass Amherst INFORMS Student Chapter President, Deniz Besik, also gave introductory remarks. Professor Balcik gave an excellent overview of the work that she has done in humanitarian logistics along with the methodologies that she has applied from two-stage stochastic programming to robust optimization. She also noted, on the practical side, what kind of organizations she has worked with, which have included: the Red Cross of Turkey, World Vision, the World Food Program, and when she was a postdoc at Northwestern, working with Professor Karen Smilowitz, the Chicago food bank. She spoke on needs assessment, post a disaster, both short-term (within 72 hours) and long-term, and emphasized how different community groups may need different items from different sectors, such as shelter, food, medicines, hygiene, etc. Needs assessments are critical since then one can have more accurate appeals to donors as well as prioritization. She mentioned that Field Assessment Coordination Teams (FACT) of the IFRC do needs assessments and deploy within 12-24 hours. 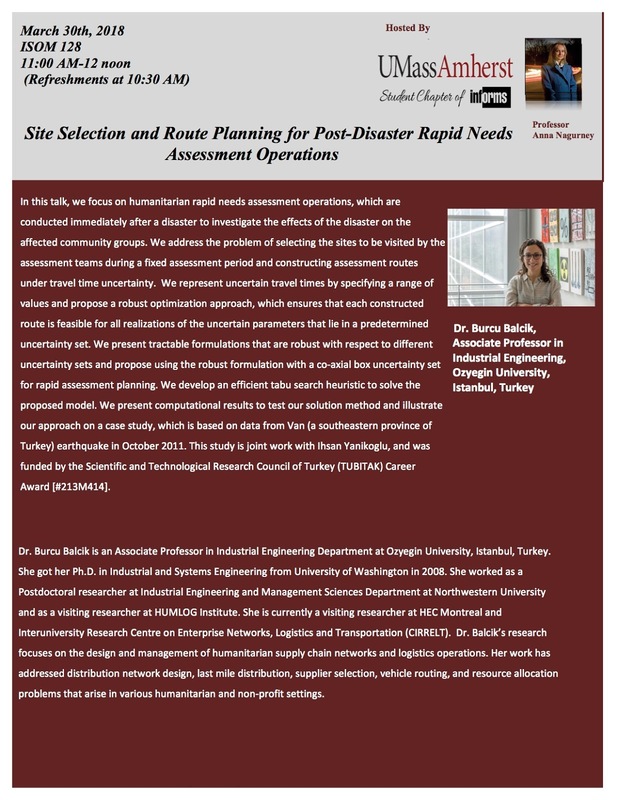 Although there are documents and practitioner-type studies on needs assessment, there is only limited scholarly research on the subject (besides the work that Burcu is doing and has done). Of course, a team cannot visit all affected areas and there is a trade-off between doing sampling and timeliness. Purposive sampling provides one with initial understanding of the scope and needs. I was delighted to see that when she listed literature on the topic she included as a first reference the paper that she wrote and which appears in the Dynamics of Disasters volume that I co-edited and was published by Springer in 2016. 4. logistic (route) planning and the importance of checking resources to implement the site selection plan. She described the mathematical models that she has developed with practical solution approach, involving heuristics, since many NGOs have no advanced computational resources. Her present research involves rapid needs assessment with uncertain travel times. This very much resonated with my students who have been learning about disasters and impacts on critical infrastructure. She described how to use robust optimization to model uncertain travel times and also discussed different tractable robust counterparts. The challenges include that probability distribution are not available although one might have estimates of lower and upper bound travel times associated with different links. She also presented computational results and many vivid illustrations of networks. Future research will include the modeling of uncertainty associated with the location of community groups and coordinated needs assessment and relief distribution. After many questions and great discussions, Professor Balcik was presented with a gift from the Isenberg School (an umbrella, which was perfect, given the weather) and we took a group photo as a remembrance of her terrific talk! I then hosted the lunch at the University Club to continue the conversations. And, as is our tradition, we shared desserts. After the lunch, Professor Balcik spent some time at the Supernetworks Lab at the Isenberg School with my doctoral students. She presented me with a lovely t-shirt, compliments of Carlos Wachzetina and the Montreal INFORMS Student Chapter, and also maple syrup from Canada (where I was born)! It is truly special how Operations Research has no boundaries and the community that it supports around the globe is flourishing from students to faculty to practitioners! She was also interviewed for the UMass Amherst INFORMS Student Chapter youtube channel. I will let you know when the interview airs. We thank Professor Balcik for traveling to UMass Amherst to share with us her truly fascinating and very important research! And, her next invited seminar will be at the University of Alabama, where she will be hosted by Professors Burcu Keskin and Emmet Lodree. I was there last Fall to speak and told her that she will love it! And to further emphasize a great, wonderful wORld: Dr. Keskin and Dr. Wakolbinger both received the Judith Liebman Award from INFORMS and co-authored guidelines on how to run a successful student chapter. Plus, Dr. Lodree also had a chapter in our Dynamics of Disasters book!